DENVER — Five miles from the picturesque downtown Denver, where skyscrapers frame the Rocky Mountains, an oil refinery is releasing tons of invisible gas into the air. "I saw a really big plume of fire coming from the refinery," said Liliana Amaro, a resident of Denver's Elyria-Swansea neighborhood. When chemicals from the Suncor Energy oil refinery in Commerce City spew out from the plant's smokestacks, Flores often documents it on her phone. "Sometimes it smells like rotten eggs; sometimes it just smells like chemicals," she said. One chemical coming from the refinery now has the attention of U.S. Rep. Diana DeGette. "There's a Suncor refinery pumping out thousands of pounds of hydrogen cyanide," said the Denver Democrat during a news conference Tuesday. DeGette said she plans to introduce legislation to force the Environmental Protection Agency to close a loophole she said is allowing Suncor to release toxic chemicals into the air unchecked. "When the EPA hasn't set a natural emissions limit for certain chemicals, such as hydrogen cyanide, using that loophole companies like Suncor are allowed to set their own limits for the chemical," she said. The bill she plans to introduce in Congress next week would require the EPA to set a federal standard for hydrogen cyanide, which Suncor and other refineries would have to adhere to and immediately limit their emissions. "We cannot sit back and allow our communities' health to be placed in jeopardy like this," said DeGette. 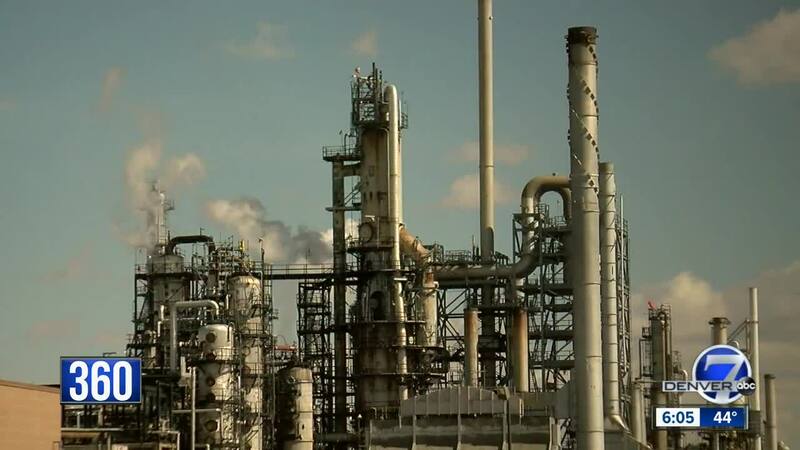 "It's considered a hazardous air pollutant by U.S. EPA," said Garry Kaufman, the director of the Colorado Air Pollution Control Division "Hydrogen cyanide is something that is emitted from all refineries. Exposure can range from breathing difficult to throat irritation. If the levels are high enough, it can cause death." The state health department is responsible for granting Suncor its permits to release hydrogen cyanide. Kaufman said while there are health risks associated with the chemical, he is standing by the limit his agency set. "It's not a problem if it's emitted at lower levels," he said. Kaufman said the state has conducted its own testing and found the concentrations people are being exposed to near Suncor are well below established health-based standards. "We have looked at the hydrogen cyanide issue, and that in and of itself doesn't pose a health risk," said Kaufman. "I don't believe it," said Loretta Martinez, who has lived in the Elyria-Swansea neighborhood for 38 years and has lost track of the number of scares from the refinery. "I'm asthmatic, so I make sure I close my windows, make sure I'm not breathing it in. I've got my vaporizer, nebulizer," she said. Just a few years ago, in 2017, a toxic orange cloud at the refinery triggered road closures and warnings to stay inside. The same year a report obtained by Denver7 showed an Xcel power outage resulted in the release of more than 100 pounds of hydrogen sulfide, a poisonous, corrosive, and flammable chemical and more than 500 pounds of sulfur dioxide which can cause breathing problems over time. "I think they need to clean up their act," said Martinez. A Suncor representative wouldn't comment specifically about hydrogen cyanide, but in a statement to Denver7 said it strives for ways to reduce emissions and aims to operate a safe facility.